The Marc by Marc Jacobs Karlie Bag is a small cross body or clutch bag, made from soft, lightly grained leather. It has a detachable gold chain and leather strap – all the metal hardware on the bag is gold coloured – and is a flap over style with a magnetic closure. On the front of the flapover there is the Marc by Marc Jacobs workwear metal plaque. 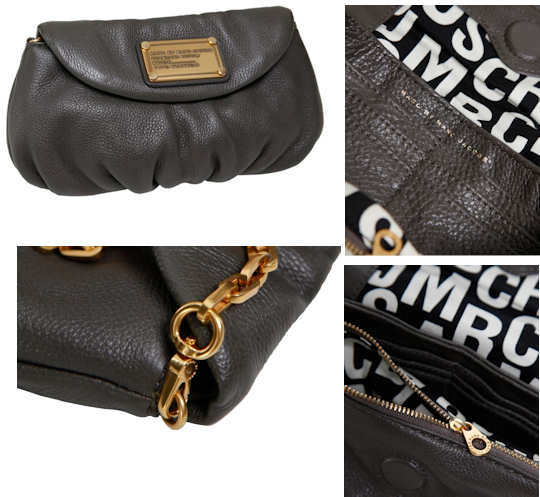 Inside, the bag is lined in a black and white Marc by Marc Jacobs logo printed material and there are slip pockets for six credit cards together with a large zipped compartment for coins. The metalwork features the Marc by Marc Jacobs branding. Style note: This is cute cross body bag, with built in features so there is no need to also carry a purse. Fab for clubbing and nights out, the chic grey colour will go with all your wardrobe and the gold chain adds a touch of luxe even if you’re not wearing jewellery. It’s also perfect to take on holiday.